Here are some photos from a recent shoot with model Kyla Lee and makeup artist/hairstylist Catriona Armour. 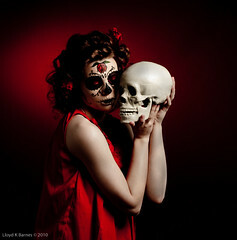 Catriona did an amazing job with the makeup, which was inspired by the sugar skulls used in connection with the Day of the Dead holiday in Mexico and other Latin American countries. Kyla is an agency model represented by John Casablancas. She was great to work with and was quick to take direction and enthusiastically worked with me to get the poses for the shots. For more on this shoot check out Kyla's blog. 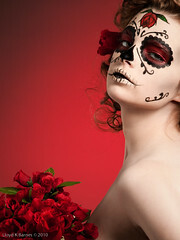 If you are using and iPhone, IPod Touch or iPad - here's a link to the Día de los Muertos video on YouTube. I love the images from this shoot and would like to thank Kyla and Catriona for a great collaboration!